An Excellent Suppliement for Students and Respiratory Therapists Alike! I don't typically don't publically post reviews of a lot of products and material, but this one I simply can't pass up. Robert Green's book, titled "Green's Respratory Therapy: A Practical and Essential Tutorial of the Core Concepts of Respiratory Care" is, hands down, one of the BEST supplements to Respiratory Care education that I have ever come accross in my long and fairly successful career. 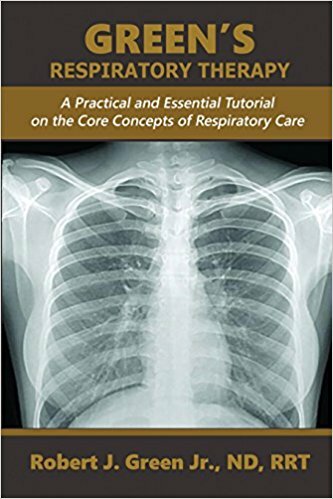 If you are a student of Respiratory Care, or even a credentialed Respiratory Therapist looking to "tune up" your already vast world of knowledge, then this IS the supplement for you! I promise you, this is well worth looking in to. American Academy of Allergy, Asthma & Immunology Oakes Respiratory Update - Home of the FAMOUS Blue-Book of Respiratory Care by Dana Oakes! MesotheliomaFund.com – Helps patients and their families get financial assistance through asbestos and mesothelioma trust funds. MessotheliomaHelp.Org - Another great resource for mesothelioma information and help and Live Chat. Asthma & Allergy Foundation of America – Education, resources, & support for asthma & allergy patients and their families, as well as healthcare professionals. American College of Allergy, Asthma, and Immunology – A wealth of information and resources. Asthma.com – In addition to all of the valuable information there are interactive on-line tools and resources. Medical Malpractice Center – Looking for Legal Assistance or Have Questions About Medical Malpractice? This is the Resource for You!